For a long time I have wondered if the talented quintet of players at Houston’s evermore popular MUSIC BOX nightclub wouldn’t eventually run out of cleverly planned and executed themes for their numerous shows each year. Happily, that time has not yet come, and “Happily” is the operative word for the current production titled, HAPPILY EVER AT THE BOX. As that title suggests, the show is built around traditional fairytales, but with an amusingly off-beat collection of princes, princesses, fairy godmothers and witches. The witty narration throughout this musical romp of “fractured fairytales” is playfully provided by fine actor and vocalist, Luke Wrobel. I had one fear at the outset, because the stunning full cast opening rendition of “Circle of Life” from Disney’s The Lion King, was so splendidly performed by all (with terrific animal mimicry included), that I immediately thought the number should have been placed as the grand finale at the close of the program. However, I’m pleased to report that song would tie in nicely at the final curtain to symbolically complete the delightful musical circle of this well-crafted night of music. We venture further into the fairytale world of royalty when Kristina Sullivan bursts forth with a lashing performance of the haunting tune, “Royal,” by Lorde. It featured smooth, harmonizing backup from the ensemble cast, and pulsing bass guitar from Long Le in the dependable G-Sharp Band ably led by Glenn Sharp. Then Cay Taylor takes the stage for a comical version of “Part of Your World,” from The Little Mermaid, which, through the miracle of amusing subtitles (and shots of Rosie the Riveter and CEO Barbie), is shaped as an outline of the Women’s Rights Movement with a fierce quest to “honor our foremothers” while searching for equal pay, maternity leave etc. That would be about it for political statements. The band tips its hat to the music of Billy Joel with the Overture to Act Two, and the cast followed with a wonderful a cappella version of the Queen hit, “Somebody to Love.” Another highlight was the gents’ near-operatic duet of “Agony” from “Into the Woods,” ending with Brad’s bobbing head and wide-mouthed grin making him look a bit like some cheerful marionette. Soon, with a terrific “Runaround Sue,” he would seem to conquer yet another musical style almost as though he had invented it. Rebekah’s soaring, “He’s a Tramp,” pairs well with Luke’s, “The Lady is a Tramp,” and he soon shifts us from cheerful nonsense to musical richness with his tender performance of Randy Newman’s, “I Think It’s Going to Rain Today.” Kristina continues that tender mood with, “What a Wonderful World,” as Cay and Rebekah sweetly round out that thoughtful trio. Then, for a final touch of musical hilarity, Luke delivered an uproarious take-off on Mick Jagger as the group performed that eternal verity, “You Can’t Always Get What You Want.” While that may be true, if you’re looking for a night on the town with great entertainment, there’s always a good chance you will find it here at The Music Box. 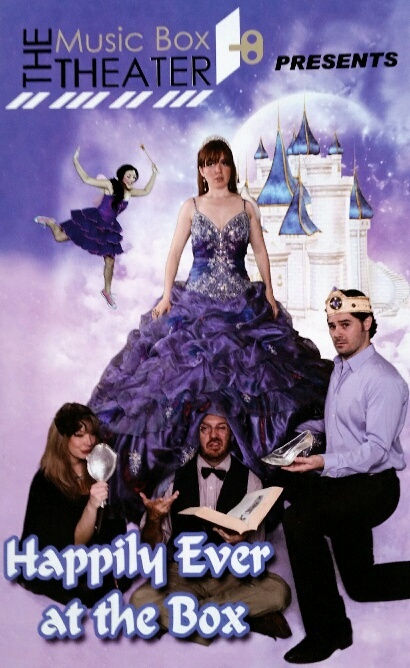 HAPPILY EVER AT THE BOX continues through May 13th at the Music Box Theater, 2623 Colquitt, Houston, Texas, with 7:30 p.m. performances on Fridays & Saturdays. Reserved seating for all shows is $37 and General Admission is $27. For tickets and information call 713-522-7722 or visit the website at www.themusicboxtheater.com. 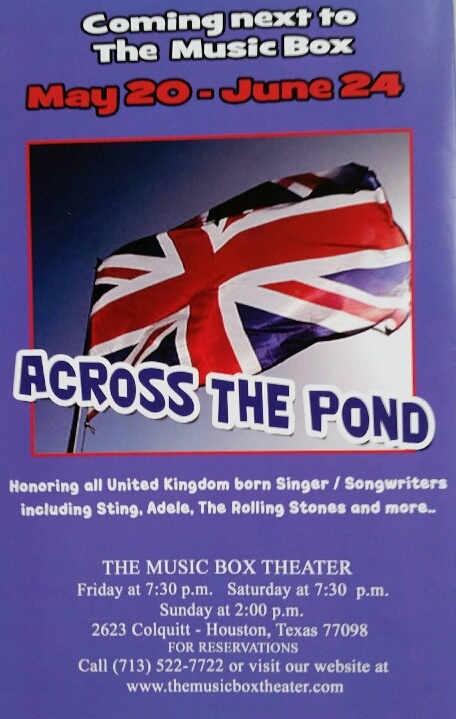 There, fans can even reserve tickets for the next show, “ACROSS THE POND,” (May 20th-June 24th) It will be a tribute to singers & songwriters born in the United Kingdom, and will include music of Sting, Adele, The Rolling Stones and more. David Dow Bentley III, writes columns about the performing arts which are featured in newspapers from the East Coast to the Gulf Coast. A member of the American Theatre Critics Association (ATCA), The International Theatre Critics Association, and America's oldest theatrical club, The Lambs, he also had long service as the editor of The Lambs' Script magazine. Mr. Bentley may be contacted via e-mail at ThePeoplesCritic3@gmail.com. This entry was posted in BroadwayStars.com, Houston Chronicle, Music Box Theater, Nightclubs, ThePeoplesCritic.com and tagged BroadwayStars.com, Cabaret, clubs, comedy, Music Box Theater, ThePeoplesCritic.com. Bookmark the permalink.